This leads to one question : Why is New York City putting forth a radical redesign of Washington Square Park, a great public space? Now is a good time to contact the New York City Council as they prepare for hearings next week on the Parks Department Preliminary Budget! The Parks Department needs further oversight by the New York City Council. 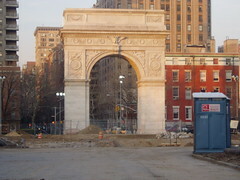 The Washington Square Park “renovation” alone has skyrocketed from $16 million to $25-30 million, an outrageous figure. We’re alarmed that the city is using this radical and unnecessary overhaul (and the rising cost) as a backdoor method to privatization of the Park. Everyone agrees that the Parks Department let Washington Square Park fall into disrepair and that the Park needs some repair. 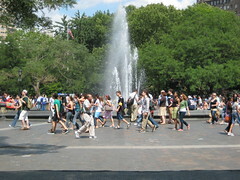 It does NOT need a redesign which reduces the public gathering space, relocates and gives naming rights of the historic fountain (to the Tisch Family after they contributed $2.5 million to the Mayor’s Fund), and moves virtually every piece of this successful Park into a new location. 11 trees have been cut down thus far for this folly. As a great public space (see Project for Public Spaces study of Washington Square Park), what is the reason for this outrageous redesign? A responsible budget by the Parks Department would allow for Washington Square Park to be modestly repaired while allocating funds to Parks throughout the five boroughs in communities that desperately need the attention. For other problems with the Parks Department, refer to this previous entry. note: CLICK on the photo above for more detail. 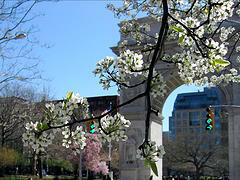 It shows the Arch minus the Fountain (the two had been standing together OVER one hundred years). The fountain area is all torn up. This leads to only one question : Why is the city putting forth a radical redesign of Washington Square Park, a great public space?